It is with great sadness that we report that actor Dave Madden, voice of Bernard Walton on Adventures in Odyssey, passed away at the age of 82 on January 16, 2014. The actor who brought us one of Adventures in Odyssey‘s most popular characters died of congestive heart failure after a long illness. Since 1990, Madden has voiced 11 characters on Adventures in Odyssey, including Bernard Walton. Madden is best known for his role as Reuben Kincaid on The Partridge Family. Dave also made notable guest appearances such as Happy Days, The Love Boat, Fantasy Island, and other TV shows. 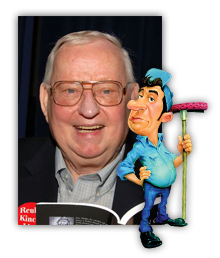 Dave Madden voiced long-time character Bernard Walton from 1990-2008 for Adventures in Odyssey. Personally, Bernard Walton was one of my favorite characters as he brought a unique humor and charm to the show, not to mention his many Bible stories. Many fans have enjoyed his friendly banter with cousin Eugene on their road trip to California, his many “Bernardisms”, and the warmth he brought to the show. The character of Bernard Walton was written out of the show preceding a re-launch of the show in 2010. Dave Madden first appears in Honor Thy Parents last appears in B-TV: Live, recorded in front of a live audience in 2008. Farewell, Mr. Madden. Thank you for everything you did to make Adventures in Odyssey great.